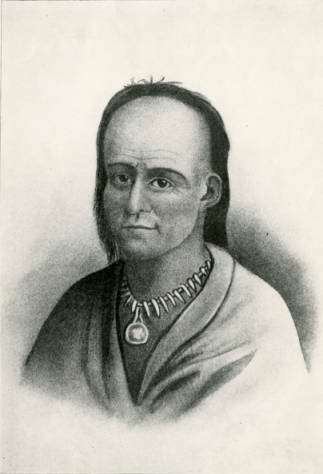 Reproduction of a portrait of Little Turtle, also known as Mich-I-kin-I-Qua, a war chief of the Miami Tribe, ca. 1790-1812. Little Turtle and Shawnee chief Tecumseh led the Miami and Shawnee people to resist white settlers in the western part of Ohio. They successfully defeated United States soldiers led by Josiah Harmar in October 1790 and soldiers led by Arthur St. Clair in 1791. An attack on Fort Recovery failed in 1794 and Little Turtle wanted to negotiate with the settlers. Other chiefs wanted to continue fighting. The American Indians lost at the Battle of Fallen Timbers and in 1795 they signed the Treaty of Greenville ceding most of Ohio to the settlers. Little Turtle, also known by his Native American name Michikinikwa, was a war leader of the Miami Indians. He was born around 1752, twenty miles northwest of modern-day Fort Wayne, Indiana. Aside from his participation with and support of the British in the American Revolution, few definite facts are known regarding Little Turtle’s early life. With the Treaty of Paris (1783), England gave up all claims to the Ohio Country. Settlers rapidly came across the Appalachian Mountains to the Northwest Territory. Little Turtle played a leading role in the efforts of the American Indian confederation that sought to halt the westward expansion of these settlers. The confederation began raiding U.S. settlements. In 1790 General Josiah Harmar led 1,400 soldiers into Miami and Shawnee lands, by order of President George Washington, in response to these raids. In October, Little Turtle and his followers, including the future Shawnee chief Tecumseh, fought and defeated Harmar’s force in the battle that became known as Harmar's Defeat. In 1791, General Arthur St. Clair led two thousand U. S. soldiers against the American Indians in western Ohio. Once again, Little Turtle led the Native Americans to victory at a battle known as St. Clair's Defeat. This was one of the worst defeats ever sustained by the American military. During 1794, Little Turtle led attacks against supply trains belonging to the United States army. These trains were trying to supply the numerous forts that General Anthony Wayne had ordered built. These forts were to serve as staging areas for future campaigns against the Native Americans living in western Ohio. Little Turtle attempted to seize Fort Recovery in 1794, but was unsuccessful. Following this defeat, the American Indian confederation fractured. Little Turtle, realizing the futility of the confederation’s continued military resistance, encouraged his followers to negotiate with the U.S. He understood that the people of the United States far outnumbered the Native Americans and had many more weapons. Other American Indian war leaders, such as Shawnee war chief Blue Jacket, refused to listen, and insisted that General Wayne's approaching army must be fought. Shortly after rejecting Little Turtle's call for peace, the American Indians led by Blue Jacket lost the Battle of Fallen Timbers in 1794. In 1795, Native Americans living in western Ohio sent representatives to Fort Greenville where they met in council with the Americans. After lengthy discussion, they signed the Treaty of Greenville. The Americans Indians present, including Little Turtle, agreed to give all but the northwestern corner of modern-day Ohio to the United States. Little Turtle refused to take up arms against the United States ever again. He became a celebrity among the people of the United States. He visited many eastern cities and even met George Washington in 1797. He urged his fellow American Indians to keep the peace and also encouraged them to give up consumption of alcohol. During the early 1800s, he played an important role in preventing the Miami Indians from joining Tecumseh's confederation. He died on July 14, 1812, in Fort Wayne, Indiana. Anson, Bert. The Miami Indians. Norman: University of Oklahoma Press, 1970. Carter, Harvey Lewis. The Life and Times of Little Turtle: First Sagamore of the Wabash. Urbana: University of Illinois Press, 1987. Young, Calvin M. Little Turtle (Me-she-kin-no-quah): The Great Chief of the Miami Indian Nation; Being a Sketch of His Life Together with that of Wm. Wells and Some Noted Descendants. Greenville, OH: Calvin M. Young, 1917.